These holdfasts are the cementing end of stemmed echinoderms, conveniently called pelmatozoans when we don’t know if they were crinoids, blastoids, cystoids, or a variety of other stemmed forms. I suspect these are eocrinoid attachments, but we have no evidence of the rest of the organism to test this. The hard substrate for the echinoderms is a flat-pebble conglomerate, a distinctive kind of limestone found mostly in the Lower Paleozoic. 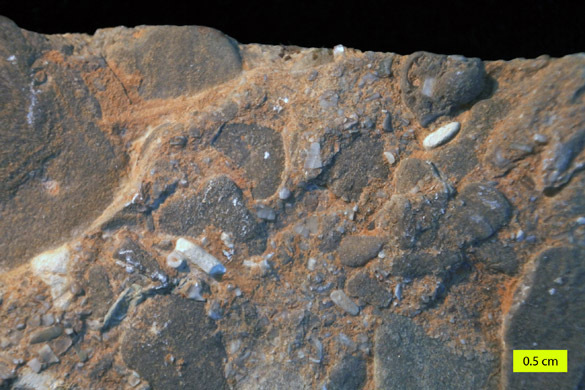 They are in some places associated with limited bioturbation (sediment stirring by organisms) and early cementation, but there are other origins for these distinctive sediments (see Myrow et al., 2004). This particular flat-pebble conglomerate was itself cemented into a carbonate hardground, as seem in this cross section. The pelmatozoan holdfasts are just visible on the upper surface. 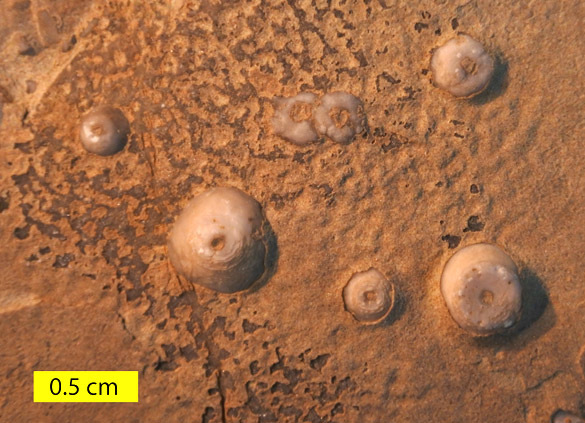 These pelmatozoans are among the earliest encrusters on carbonate hardgroounds and thus have an important position in the evolution of hard substrate communities. Brett, C.E., Liddell, W.D. and Derstler, K.L. 1983. Late Cambrian hard substrate communities from Montana/Wyoming: the oldest known hardground encrusters: Lethaia 16: 281-289. Myrow, P. M., Tice, L., Archuleta, B., Clark, B., Taylor, J.F. and Ripperdan, R.L. 2004. Fat‐pebble conglomerate: its multiple origins and relationship to metre‐scale depositional cycles. Sedimentology 51: 973-996. Sepkoski Jr, J.J. 1982. 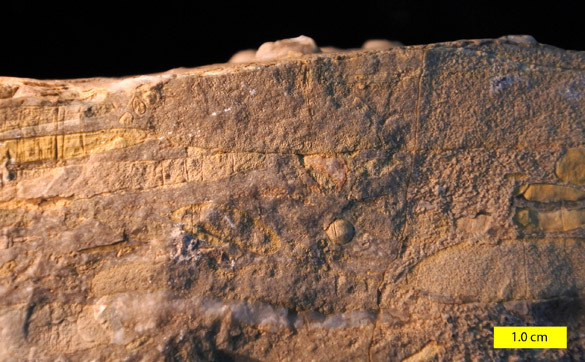 Flat-pebble conglomerates, storm deposits, and the Cambrian bottom fauna. In: Cyclic and event stratification (p. 371-385). Springer, Berlin Heidelberg.